Power and authority in Mbala society rests in the female line. Their fertility sculptures depict a seated or standing female carrying a child on her left hip, nursing an infant with her left breast, or holding a child with her left hand to reinforce the idea that “left” and “left hand” are synonymous with femininity. 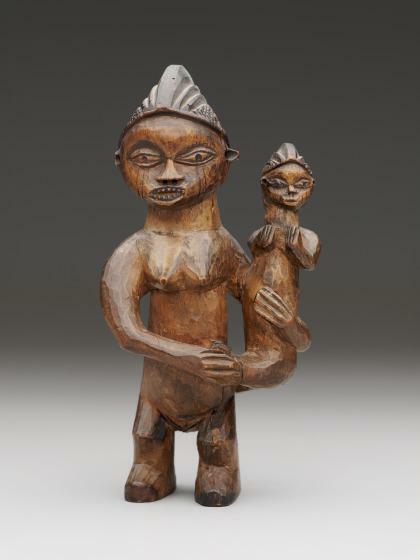 Such maternity figures are usually paired with male figures that are portrayed playing a drum. This maternity figure holds her child, who isn’t touching her, on her left side. Although the mother and child are looking out at the viewer rather than at each other, they are physically and emotionally connected. The sculptor exaggerated the mother’s embrace by carving her arms in an expressionistic rather than naturalistic manner. Her shoulders are minimized and slope downward to the left side. She holds the infant’s feet with her right hand while she wraps her left arm around its torso. Her left hand slanted upward completes this circle of protection. Drummer and maternity figures were commonly owned by chiefs or major lineages as part of the royal treasure, but their meaning and the context(s) in which they were used are not certain. Called pindi, they were invoked to provide supernatural aid in times of war, periods of poor harvests or lack of game, epidemics, or natural disasters. The chief was a diviner and a ritual specialist who was expected to successfully mediate between his ancestral spirits and the fertility of his subjects and their environment. Because virility was an important criterion for his position, mother-and-child figures may symbolize a clan chief’s numerous wives and children as well as a woman’s essential role as child bearer. The tradition of figurative sculpture went into decline in the 1920s and finally ceased to exist in the face of European influence before the middle of the 20th century. Nonfigurative regalia for chiefs were, however, retained. Roslyn A. Walker, The Arts of Africa at the Dallas Museum of Art (New Haven and London: Yale University Press, 2009), 116-117.